Состоялась встреча Премьер-министра Народной Республики Бангладеш Шейх Хасины Вазед с Научным руководителем ИВ РАН, чл.корр. РАН В.В. Наумкиным. 30 августа 2015 года Премьер-министр Народной Республики Бангладеш Шейх Хасина Вазед приняла в своей резиденции Научного руководителя ИВ РАН, член-корреспондента РАН Виталия Вячеславовича Наумкина. В ходе встречи состоялась длительная беседа по итогам которой планируется издание книги "Беседа с Премьер-министром Народной Республики Бангладеш Шейх Хасиной Вазед" (рабочее название). "The Russian Academy of Sciences will publish a book on Prime Minister Sheikh Hasina in different languages, reports BSS. The Institute of Oriental Studies of the Russian Academy of Sciences will publish the book as part of a series of books on leaders who are changing the world, head of the academy Dr. Vitaly V. Naumkin said as he paid a courtesy call on Prime Minister Sheikh Hasina at her office in the capital yesterday. Dr. Naumkin said the book on Hasina would be published in different languages, including Russian, English, Arabic and Bengali. Recalling the visit of Bangabandhu Sheikh Mujibur Rahman to Russia in 1974, Dr Naumkin mentioned that he had worked as an interpreter during the tour. 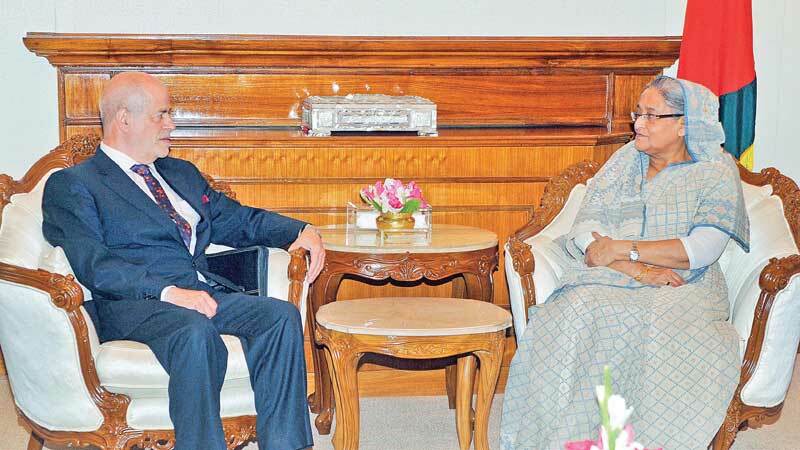 Hasina also recalled unequivocal support of Russia during Bangladesh's Liberation War in 1971, and the then Soviet government’s massive contribution in rebuilding the war-ravaged country."